While Los Angeles itself has plenty to offer, the city can be quite overwhelming, especially for people who aren’t used to cities of this magnitude. During the month I spent in the West Coast metropole last year, I became increasingly frustrated about the long drives and traffic several times – can it really take 90 minutes to cover an eight mile distance? I found myself wishing for small town conveniences on various occasions (usually while stuck in a traffic jam on the 405), and that’s when I realized it may be a good idea to check out some nearby cities of a more manageable size to see what they have to offer. Luckily I had enough time to check out several cities right in Los Angeles county, some along the coast, some just outside the L.A. city limits. Each one was special and unique in their own way, and worth a visit for things that the others didn’t have. 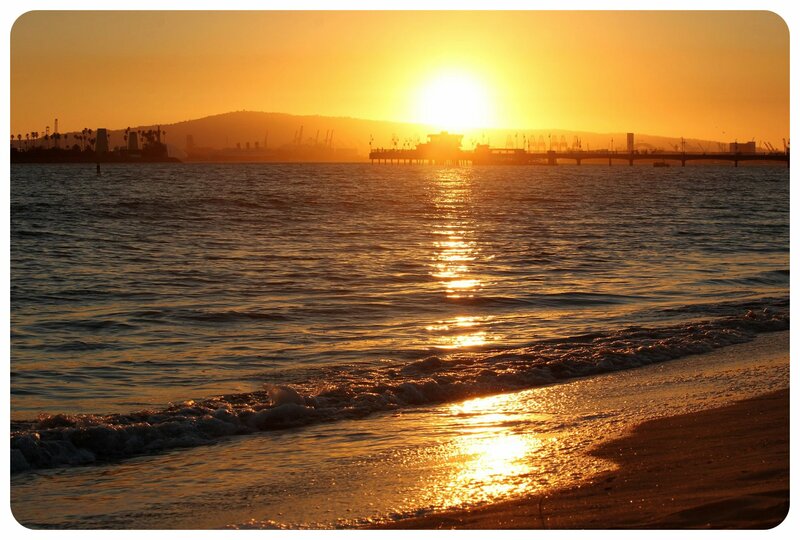 Long Beach is LA’s big neighbor to the south, California’s 7th largest city and second busiest container port in the U.S. The massive port has led people to believe that Long Beach is nothing more than a big industrial city, but I found out that the city itself is actually a fine escape from L.A., offering a downtown area that is walkable and, as its name suggests, a pretty long beach. The coastline is actually divided into different smaller beaches, but what they all have in common is that they are wide, sandy, and have a bike & running path that follows the shore for miles. I was surprised to find more independent coffee shops that I could possibly try in a day (Rose Parks and the Library Coffee House were among my favorites), colorful street art (especially in the East Village Arts District), and the quaint Belmont Shore neighborhood with its Spanish-style homes from the 1920s and 1930s and palm-fringed streets. The one thing that really had the ship lover in me the most excited weren’t the freight ships that majestically glide in and out of the port, but the original Queen Mary ocean liner that is retired in Long Beach and can be visited, which is best done by having drinks at the Observation Bar. If you arrive hungry in Long Beach, for breakfast head to the Coffee Cup, Sweet Dixie or Fuego At The Maya. If you get hungry later in the day, head to Los Comprados for Mexican or to Nick’s for classic American comfort food. For beer lovers, Belmont Brewing right by the beach is a must and its happy hour makes it a perfect sunset hangout. There are quite a few hotels in Long Beach, most of them conveniently located in the Downtown area, in walking distance to the beach. Malibu is located west of L.A. and is known for its stunning cliff views over the ocean, as well as lovely Zuma Beach and Malibu Lagoon State Beach, which is especially popular with surfers. 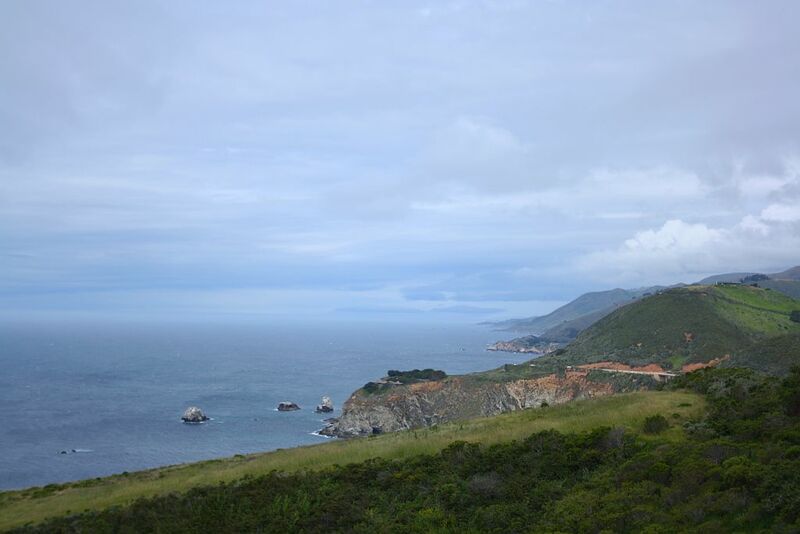 The city stretches along the ocean for nearly 30 miles and a ride along the Pacific Coast Highway is the perfect way to get a first glimpse of what is some of California’s finest coastline. The other big draw of Malibu is that it is right near some hiking trails in the Santa Monica Mountains, where you can hike through canyons and to waterfalls. A great hike that is not too difficult and only takes two hours is the Solstice Canyon hike, but if you want a bit more of a workout, head up the Mishe Mokwa Trail to Sandstone Peak, which inclines 1,600 feet and offers amazing views over the Malibu coast, and on a good day, all the way to the Channel Islands. Check out this article for more Malibu hikes – the 7.5 mile Puerco Canyon hike is already on my to-do-list for my next California stint. The Malibu Pier is also not to be missed, and while you’re there, have dinner at Malibu Farm, an organic cafe right at the end of the pier. The best time to visit is at sunset, but their breakfast dishes are also absolutely delicious. Pasadena is located northeast of L.A., and is a food lover’s paradise: There are over 500 restaurants here, including the only Michelin-rated hotel restaurant in Southern California, The Langham Huntington, and don’t miss the 46-year-old Pasadena landmark Pie ‘n Burger. Architecture buffs will love Pasadena for its historic homes: Bungalow Heaven is a Landmark District made up of 800 small craftsman bungalows built between 1900 and 1930, the Gamble House being the most famous one, known as the masterpiece of the Arts & Crafts period. Art lovers shouldn’t miss the Norton Simon Museum, an extensive art museum with a wonderful sculpture garden and a remarkable contemporary art section. 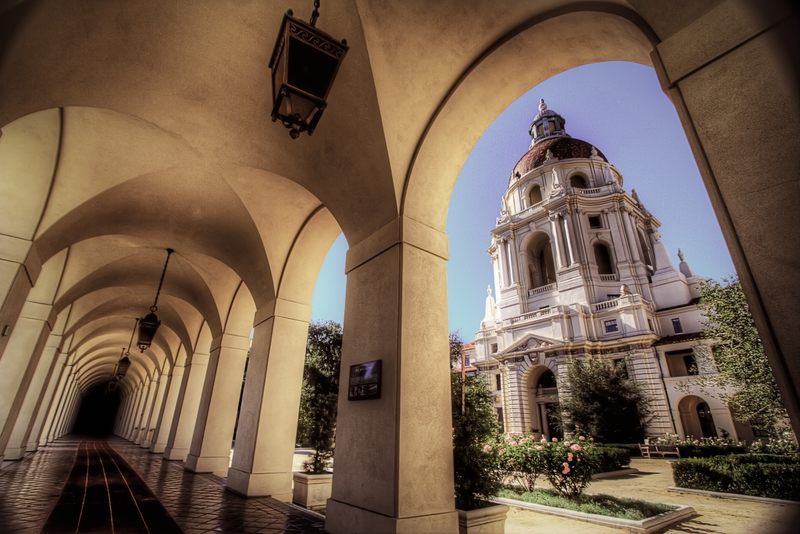 Here are some great places to stay in Pasadena. Anaheim is home to the ‘Happiest Place On Earth’ – Disneyland! If you’re a theme park fan, Anaheim will surely be included in your L.A. itinerary already, but even if you are not a Disney fan or an amusement park aficionado, you’ll appreciate Anaheim for the historic Packing District, including the gorgeous Farmer’s Park with an olive grove, gardens and a weekly farmer’s market on Sundays. The Packing District is made up of three 1920s commercial spaces which have been refurbished and now house some of the city’s greatest eateries. Make sure to stop at the Old Packing House, a historic 1919 citrus packing house turned into an upscale food court with local vendors and bars. Beer lovers flock to Anaheim for its numerous microbreweries which resulted in Anaheim being named the ‘Beer Capital Of Orange County’. 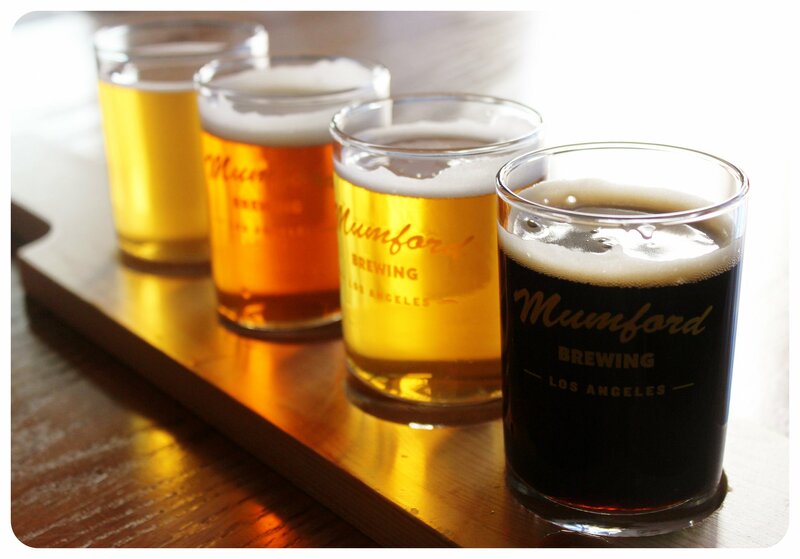 Check out this list of breweries to plan a self-guided brewery hopping tour around Anaheim. 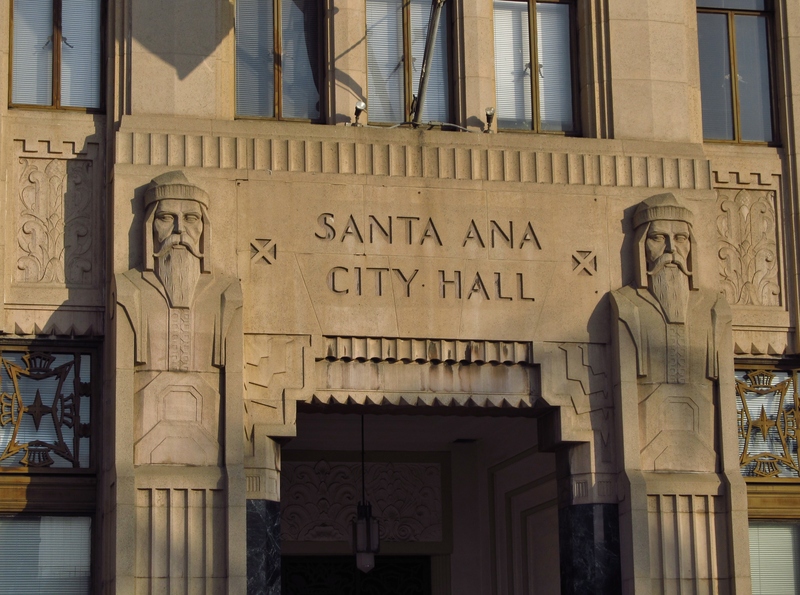 Santa Ana sits southeast of Los Angeles and its primary draw is the Historic Downtown district which is famous for its art deco houses. In addition to the historic architecture, you’ll find the Artists Village downtown, which is an area filled with art galleries and studios as well as some fantastic restaurants. The Artists Village was part of an initiative to bring abandoned downtown areas back to life, and it has certainly worked here. 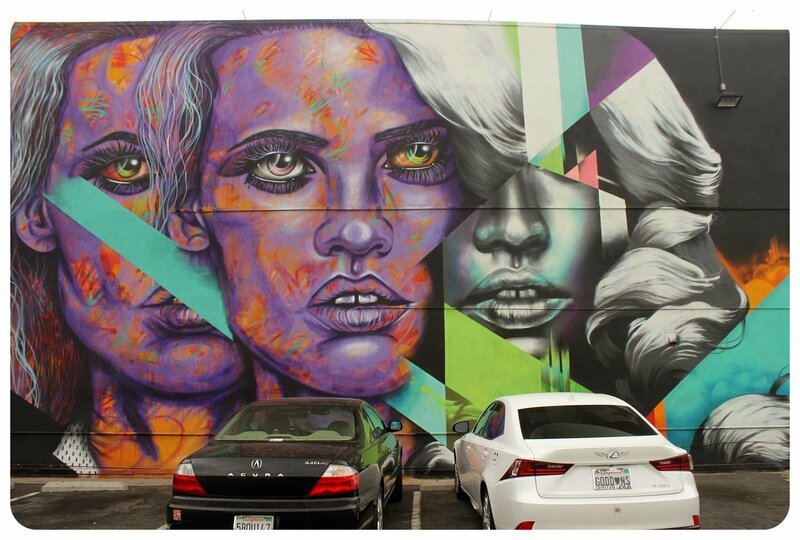 The Orange County Center for Contempory Art and the Cal State Fullerton Grand Central Art Center are both worth a visit. Historic ‘Calle Cuatro’, or 4th Street, is also part of the historic downtown and lined with restaurants, independent shops and boutiques, craft beer breweries and the 4th Street Market, which is an indoor food market. Click here for some amazing Anaheim hotel deals. Photo Credit: Photos used via Flickr’s Creative Common license. 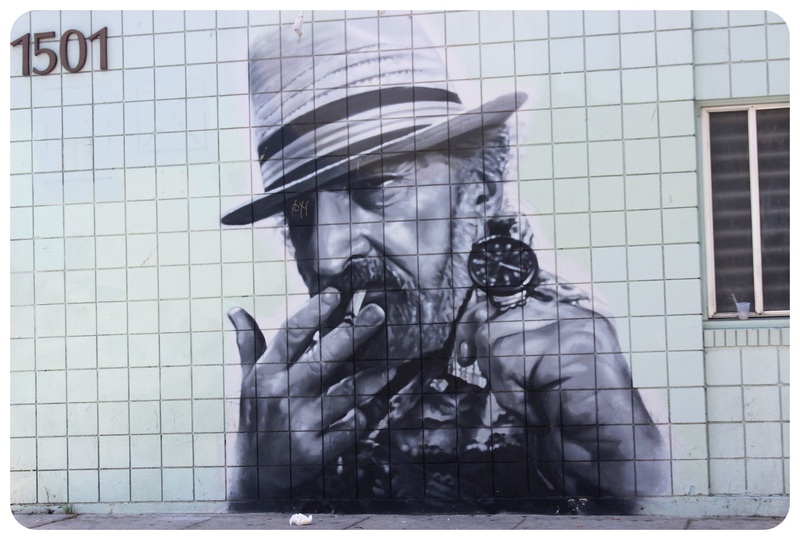 Pasadena by Graham, Santa Ana by Jasperdo. The stretch of Sunset Boulevard that runs though Silver Lake felt indeed very Williamsburg-like, and just like the famous hipster neighborhood in Brooklyn, it is lined with trendy cafes, quirky independent shops and little eateries, and street art fills many a wall stretching into the side streets off of Sunset Blvd. I couldn’t help but fling in love with silver like within fifteen minutes of getting there – this is definitely my kind of neighborhood! Unpretentious, with inventive yet affordable restaurants but also hole-in-the-wall Mexican street food, funky bars and shops that go beyond your usual chain stores: instead you find spice stores, comic book stores and guitar shops. 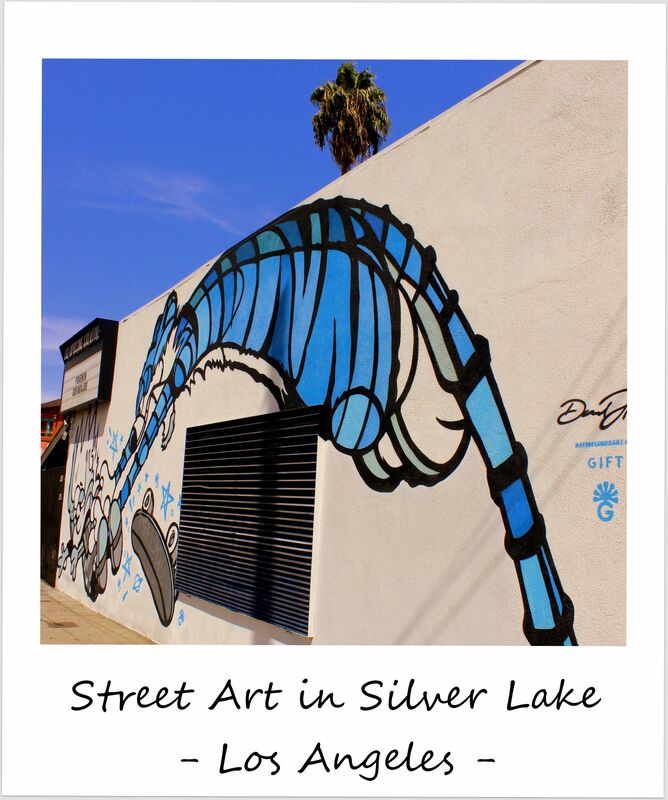 There are two basins – the neighborhood’s namesake Silver Lake Reservoir and the Ivanhoe Reservoir, both offering walking and running paths and a natural setting to escape the noise along the busy main streets. Speaking of walking: I found Silver Lake to be walkable and cycleable, something that can’t be said for all neighborhoods in this car traffic-heavy city. I wish I would’ve had time to check out the bar scene on my visit but I guess it is good to have an excuse to come back to Silver Lake next time I’m in L.A.! It used to be a bit tricky to get up to the sign until a few years ago, unless you were a local and knew your way around. The Trust For Public Land, that is in charge of protecting the sign and the surrounding lands, has made it much easier now to find the right paths and not get lost in the relatively remote and rugged southern side of Mount Lee, on which the sign is located. There are now several hiking routes: the Mt Hollywood Trail (short and moderately difficult), the Canyon Drive Trail (longest route), and the Cahuenga Peak Trail (the shortest, but most challenging). We took a shorter version of the Mt Hollywood Trail, which can be started at the Griffith Observatory (3.5 miles round trip) or at Sunset Ranch at the northern end of N Beachwood Drive. The ranch offers guided horse rides up the sign, by the way. The hike is pleasant, with sweeping views over parts of L.A., Glendale and The Valley from various viewpoints along the way – but the star of the show, the sign itself, stays out of sight for the most part. We started our hike at Sunset Ranch, but next time I’d start at the Griffith Observatory for a longer hike and better views of the sign itself. When you get to the sign, the most astonishing thing is seeing how big these letters actually are: each letter is 45 feet tall (14 meters) and all of them next to each other are 350 feet (110 meters) long! My height compared to it: 5.8 feet. If you’re thinking about climbing the security fences that fence off the sign, be warned: the charges are no joke. Trespassers face a $1000 fine, restitution to the City agencies involved in the trespasser’s arrest, a one-year probation period and 20 days on a Cal Trans highway crew. You can find more information on the hikes to the Hollywood sign here. 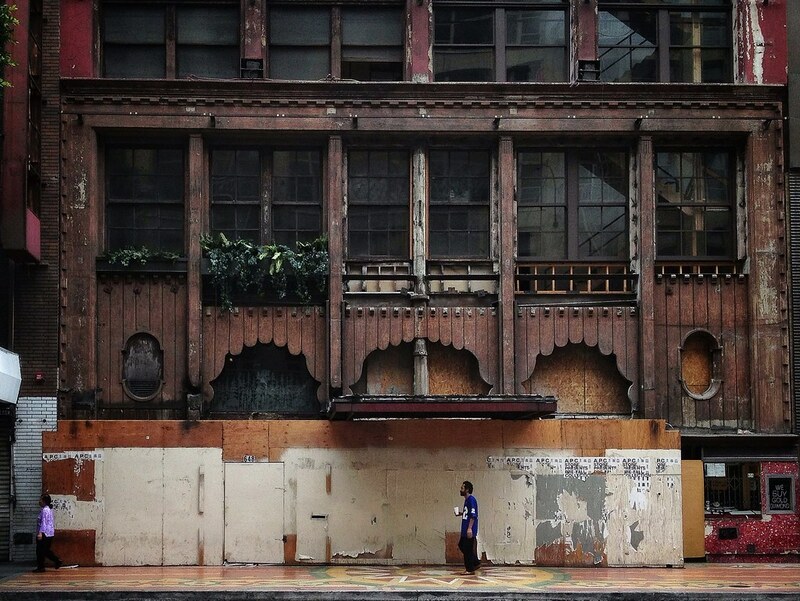 As one of the most iconic places on Earth, Los Angeles deserves its grand name. It truly feels like the City of Angels, especially when surrounded by the glitz and glamour of Hollywood. Whether you’re wowed by the prospect of meeting your favorite celebrities in person, or seeing them immortalized on the Hollywood Walk of Fame, you’re not leaving until you’ve seen it all. 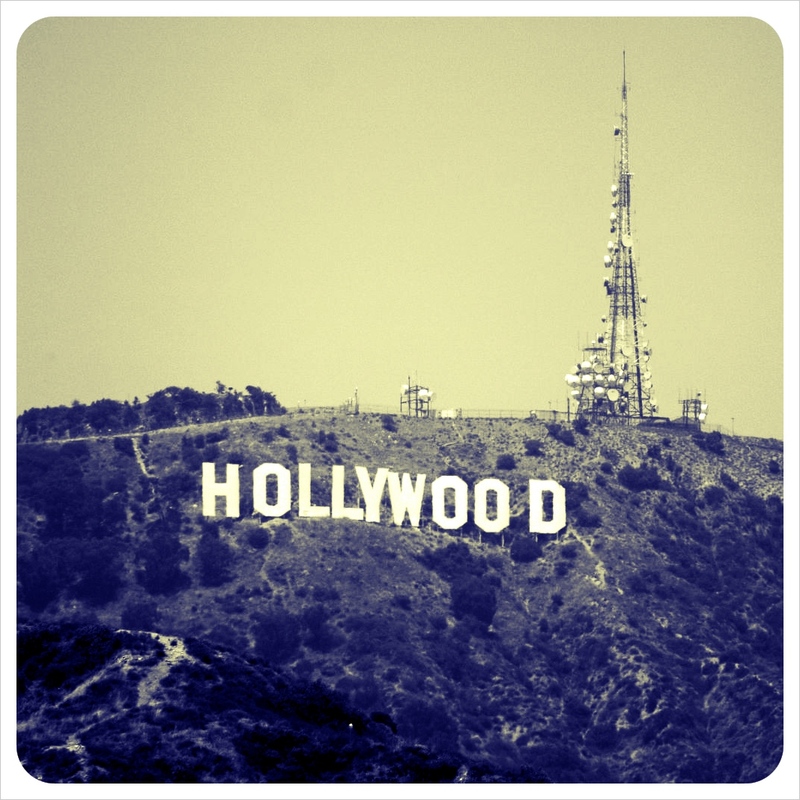 If you’re visiting LA and Tinseltown, these are the famous landmarks you have to see. 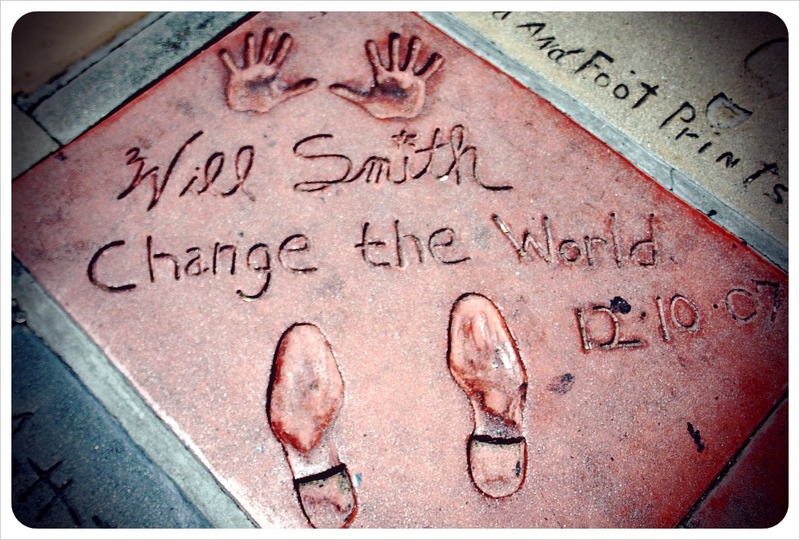 What’s so special about the Hollywood Walk of Fame? From abroad, it may be difficult to see the irresistible appeal of a mile long trail. But the Hollywood Walk of Fame is simply breathtaking. Over 2 500 stars, each celebrating a Hollywood legend, bring home the significance of where you are. They’re a living history of La La Land, and the modern entertainment industry. With millions of visitors following the route every year, and buskers and vendors setting up shop, it is a vibrant, exciting experience. There is perhaps no other sign as recognizable as the Hollywood Sign. Anyone born in the last century has a special attachment to it. So much so that when the sign was rebuilt, after a 3 month absence, the coverage of its unveiling was watched by 60 million people around the world! And this was before live coverage could be broadcast even to the furthest corners of the globe. 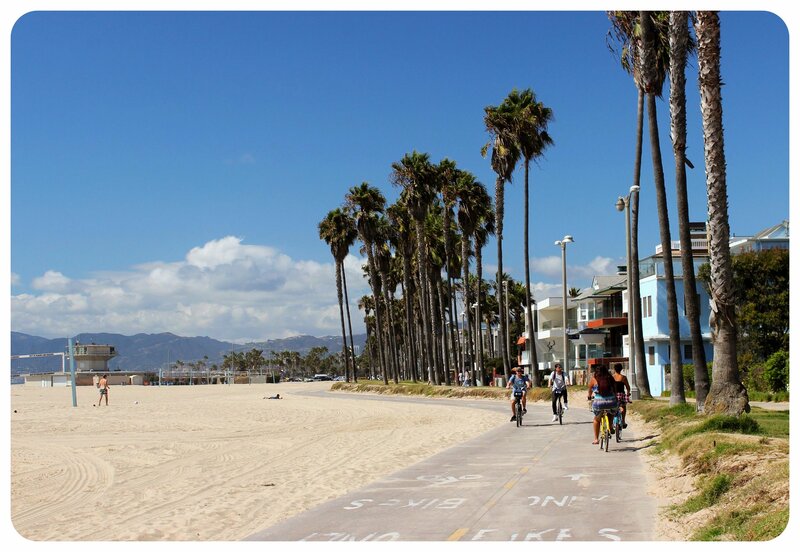 Moving away from the silver screen, let’s give a quick mention to LA’s most beloved beach. 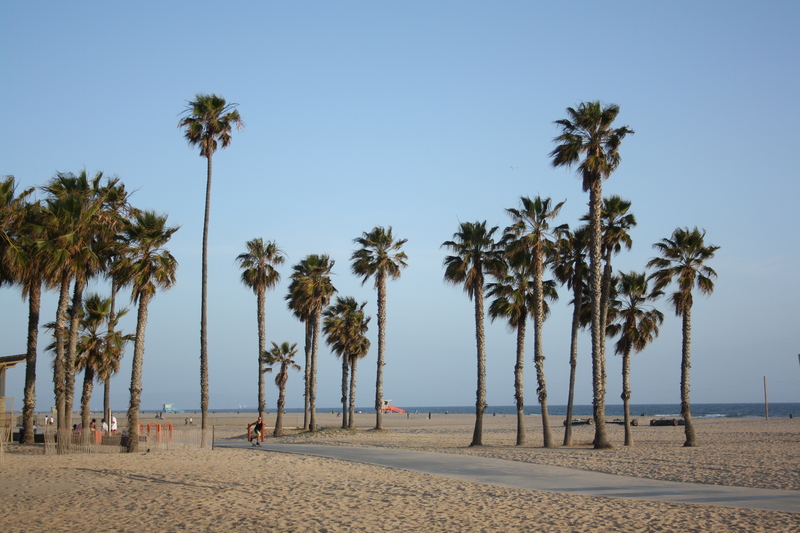 Venice Beach is such an important part of Western culture, that since 1996 live visuals have been streamed online. 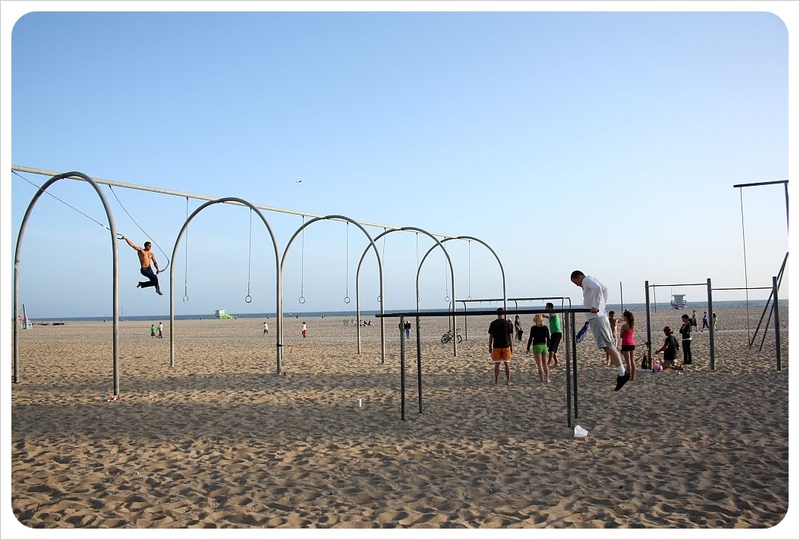 It’s always summer at Venice Beach. Although be warned that the weather can be temperamental, so be sure to bring a jersey! 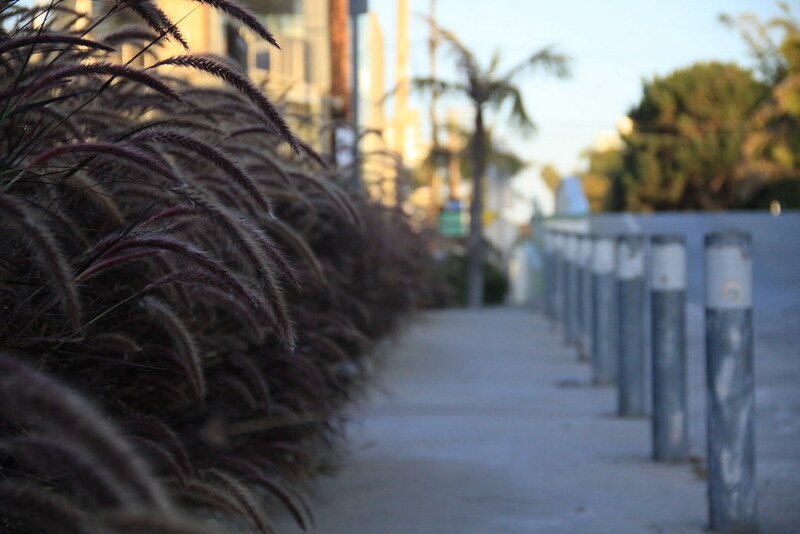 The Boardwalk is the perfect place to take in LA culture. With visitors from all over the world, year round, there is an eclectic mix between the local and the foreign. Performers are to be found every few steps. Bring a few dollar bills as tips! This Los Angeles film studio and amusement park is a must-see. Guided tours, rides, famous characters, oh my! It’s a film lover’s paradise, with Jurassic Park, Waterworld, Transformers, and even Hogwarts to keep you busy all day. If you get the chance, go to an event at the famed Staples Center. Sports events are a great way to take in American culture. Concerts performed by a wide range of artists are a special treat. There are plenty of things to do in the area before and after the event, so that you can make the most out of your day. No list would be complete without mentioning Disneyland. The most coveted theme park in the world, just the name has had children’s hearts racing since it was opened in 1955. There are countless videos on YouTube of kids’ reactions to their parents’ announcements. And it’s not only special for the kids. It seems like the travel gods aren’t on my side this year: I wish I could say that my journey to the U.S. went without a glitch, but I almost didn’t make it here. I wasn’t allowed on the plane – again. (Does this sound familiar?!) I will talk about it in more detail in my monthly round-up; at the moment I am still digesting this little major travel mishap. I eventually made it to L.A., and a few days under the Californian sun helped me recover from the incident and to relax before starting my housesit. 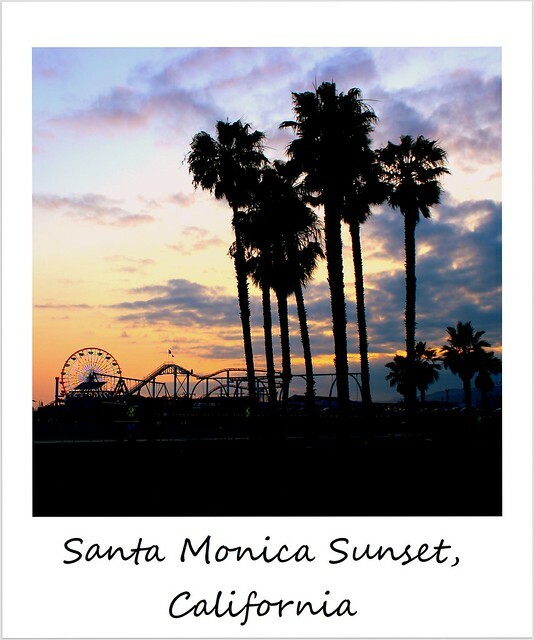 I stayed one block from the beach in Santa Monica, the perfect location to enjoy the nightly spectacle of the magnificent sunsets over the Pacific and to go on long runs along the promenade. Most of my days were spent in Santa Monica and Venice – even though it wasn’t like I hadn’t been to a beach in ages (my last beach day was about a month ago in Thailand), I cherished my beach time, knowing that these would be my last beach days for a very long time. However, I ended up braving the L.A. traffic to venture into the city to visit some of the museums I wanted to check out, hunt down new street art in West Hollywood, and try some of the restaurants that had been recommended to me. I have to admit that after the stress earlier in the week, I cut down my ambitious itinerary considerably and decided to take it slow instead, knowing that I’d be back in L.A. sooner or later anyway. 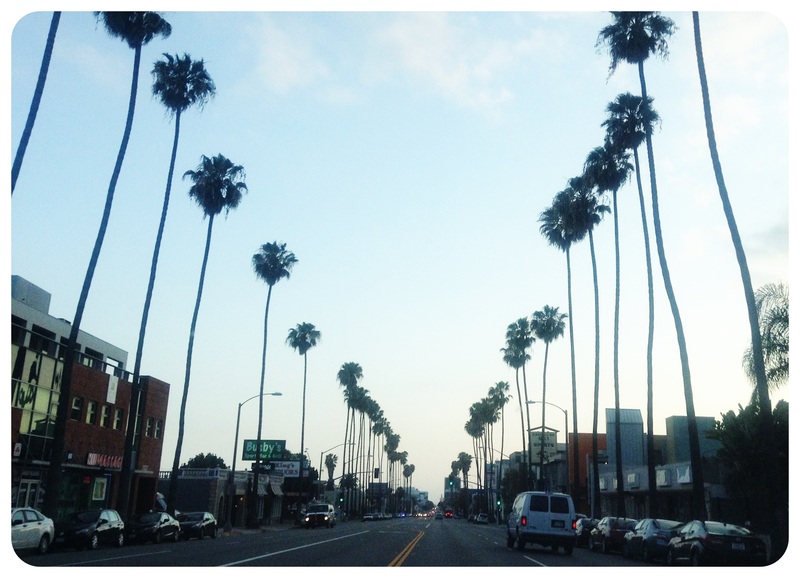 Overall, I couldn’t have chosen a better place to kick off my U.S. summer travels – thanks for the great time, L.A.! 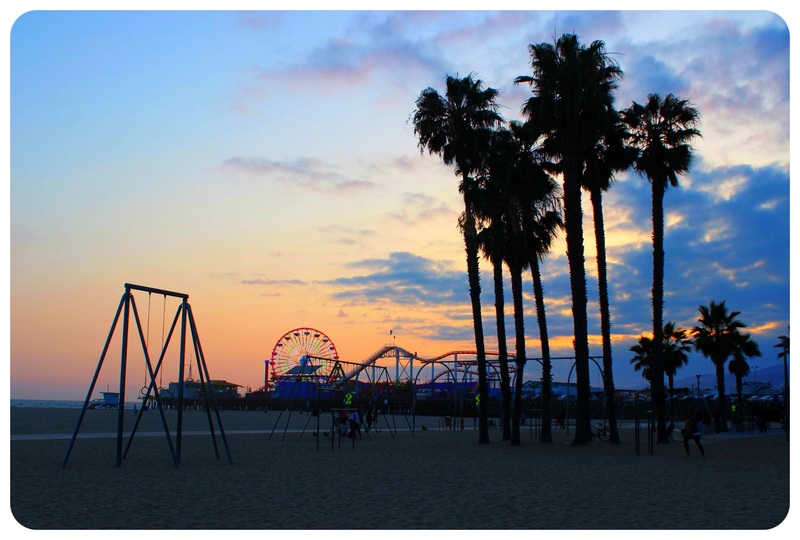 Today we are sharing a post by Polly Mack, a writer and long-term traveler who lived in LA for six months. Now based in Cornwall, UK, she loves discovering the unlikely, the unusual and the strange monuments to human achievement, wherever she goes. We only spent about ten days in L.A. in 2010, and it is one of the places we’re hoping to return to soon! Her guide to the ‘City of Angels’ includes some places we haven’t even heard of but that we’ll definitely include on our next trip to L.A.! 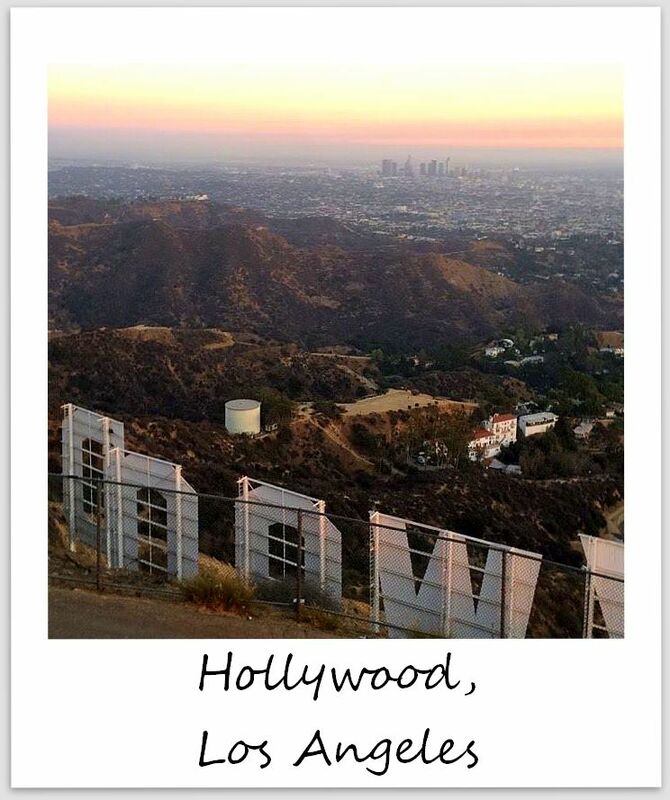 Read on for a guide to L.A. away from Hollywood and the Walk of Fame! This museum is located at 9341 Venice Boulevard in Culver City. The museum provides a ‘hands-on’ experience of what life in the Lower Jurassic period was like. Although the artifacts exhibited differ, depending on the time of year and which collections are currently visiting, patrons can expect to see scientific experiments, innovations and inventions of mankind from millions of years ago, such as a collection of thousands of decomposing dice. It’s only open from Thursday to Sunday, but this quirky find is certainly worth a visit. For those who love nature but are opposed to zoos, this wildlife sanctuary will be a memorable trip. Located at 16027 Yarnell St, Sylmar, the center is open on most days from 8:00 am to 5:00 pm. Housing animals rescued from zoos and abandoned by private owners, you can view a sloth, a Burmese python as well as over 70 other species of animal. The olive grove setting also makes for a beautiful and natural backdrop. Located in the historic Venice district, visitors to California can get a feel for what Venice looks like, for only the price of flights to Los Angeles. Having fallen into disrepair, many canals from the early 20th century were simply filled in. However, the canals were restored and reopened in 1993 and this neighbourhood has become stylish and highly desirable as a result. See the eclectic mix of old and new LA, along this series of waterfronts and walkways. For $15 and a bus ride to 6031 Hollywood Blvd, visitors can take a 45-minute self-guided tour of this most leftfield of museums, educating them on many unusual death artifacts. These include artwork of serial killers, photos of crime scenes and even the severed head of Bluebeard of Paris! Located at 1727 East 107th Street, Los Angeles, CA 90002, this folk arts center houses galleries, a museum and access to the ‘homemade’ towers themselves – built out of broken glass and bottles that are 99.5 feet tall. 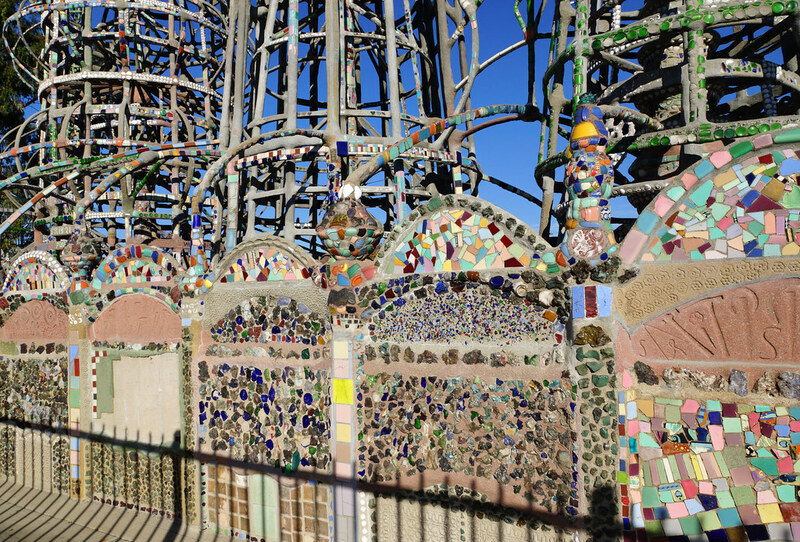 Admission to the campus includes admission to the Watts Towers Arts Center, the Watts Towers of Simon Rodia and the Charles Mingus Youth Arts Center. Listed as both a National Historic Landmark and a Los Angeles Cultural Heritage Monument, this is one attraction that has bags of personality. So next time you’re thinking of taking a stroll down the Walk of Fame or checking out the boutiques of Beverley Hills on a trip to Los Angeles, there’s an underbelly to this city which has fascinating and cultural merit all of its own. Los Angeles evokes images of star-studded Hollywood, the hidden mansions of Bel Air and the palm-tree lined boulevards of Beverly Hills. 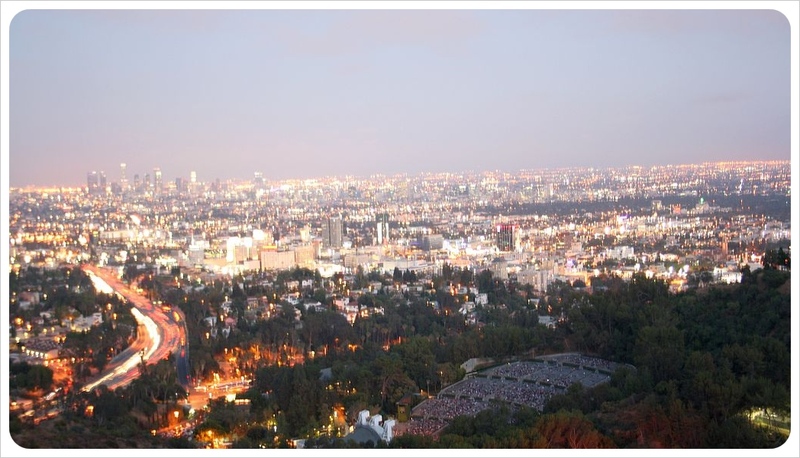 No doubt about it, the City of Angels can be a place of excess and luxury like no where else in the world, and if you’ve got the budget, you can go eating, partying and dancing with the stars. For travelers like us who are trying to stretch our budget as far across the globe as we can, the key is to minimize spending but having a top time wherever we are. With some careful research/planning, you can have a ‘So L.A.’ time without breaking the bank. Los Angeles is car territory, and there is no way to see the sights without one. The drivers in L.A. are reckless and lord, look out for the LAPD on a Saturday night around Sunset and Hollywood. However, sticking with public transportation in L.A. limits any chance to fulfill any of those Hollywood moments you had in mind before your trip. Most of the rest of this post requires a car, so head over to Enterprise or Budget and get yourself something nice. Just make sure it’s not the Budget in Beverly Hills, which seems to rent luxury cars almost exclusively. Defeats the purpose of the name ‘Budget’, but hey, this is Beverly Hills. This winding road through the Hollywood Hills is the way from the TV or music studio to the countless celebrity home nestled throughout the Hills and beyond, so odds aren’t bad you might see a few. Couldn’t care less about celeb spotting? This road climbs up, up and further up to offer some of the most spectacular and well-known views of Los Angeles. Located just a 15 minute drive up Mulholland Drive from Highway 101, Runyon Canyon is a key vista of L.A. and the San Fernando Valley. Park, slap on your running shoes and jog up and down the well-paved path which leads from the Hollywood Hills above to Sunset Blvd in Hollywood below. These two locations being havens for celebrities and their hangers-on, you’re bound to see more muscles, plastic, collagen and recipients of Botox than on any run at home, but the workout is intense and there is no need for any ‘South Beach Diet’ after a run through Runyon Canyon. Like Runyon Canyon, Griffith Observatory offers spectacular views of Los Angeles and the chance to see the stars – and the moon, and mars. Brush up on your knowledge of Astronomy atop the hill in Griffith Park and see the chaos of the city from one of the most peaceful spots in Los Angeles, plus unrivaled chances for pictures of the Hollywood sign. Read Tripadvisor review here. 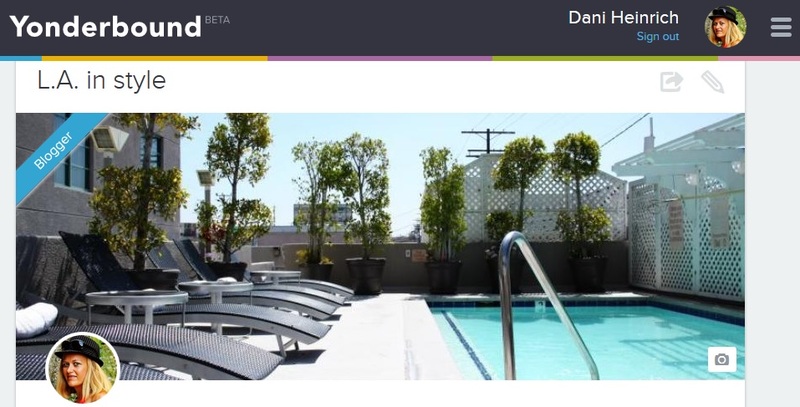 Still looking for a hotel in L.A.? 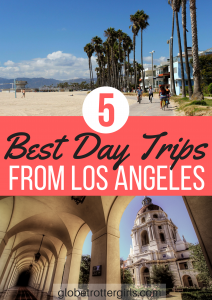 Check out my five favorite hotels to experience L.A. in style on Yonderbound! You can book the hotels straight through the site and if you sign up through my referral link, you’ll get $10 travel credit towards your booking! This 101year-old pier off the coast of Santa Monica beach is as traditional as they come. Ferris wheels, easy roller coasters, pier games, margaritas, funnel cakes and fishing off the end of the Pier. Trying to win a giant stuffed Spongebob for your girlfriend/boyfriend/son/daughter? Sure, that will cost you a pretty penny, but for a walk up and down the pier, an ice cream and a dollar bill in the hat of a Spanish guitar playing busker, a visit to Santa Monica pier is pure California for next-to-nothing. Not what might normally be associated with Los Angeles, the bubbling pits of tar in Hancock Park house the remains of mammoths and other mammals from hundreds of thousands, even millions of years ago. The La Brea Tar Pits, right in the middle of the city, are an amazing site off the side of a beautiful park, art museum, and research facility which is more closely examining the findings of one of the more recent digs at the tar pits. Yes, it’s a tourist trap, and it stretches for much further in either direction than you would expect. But the Walk of Fame is fun. You walk along, pointing out celebrities you love (or love to hate – does David Hasselhof have to have a star?!). Walking up and down Hollywood Blvd also gives you the chance to check out the shops, tattoo parlors, restaurants and bars of one of L.A.’s most visited and famous areas. This ain’t your average Farmer’s Market, so it’s best not to expect stalls spilling over with fresh fruits and vegetables at wholesale prices. This is an L.A. farmer’s market, so while it might be the ‘original’ dating back to 1934, times have changed since that July when “a contingent of farmers pulled their trucks onto an expanse of empty land at the property known as Gilmore Island at the corner of Third and Fairfax in Los Angeles”. Today the Farmers Market is home to dozens of restaurants and food stalls with French breads and cheeses, fish tacos, Italian and Greek restaurants, and stalls filled with hot sauce or sweets or baked goods (even for your pets). While I wouldn’t likely purchase the $15 bottle of Italian olives from the French bakery, the Farmer’s market is the perfect place to grab a table and a snack and people-watch in this clash of the uber-cultured, the tourists and the regular Angelinos as they all convene in this space on Third and Fairfax. It’s fine to cruise Mulholland Drive and crane your neck in every direction hoping to spot a celebrity in every Maserati or luxury SUV that drives by, but odds are, while you may soak up the Hollywood/Beverly Hills feeling, you’d never actually know it when you passed [insert your fav movie star here]’s house. Unfortunately we ran out of time to take advantage of this last tip, but we’ll be back in L.A. for a few days in July and we hope to catch a live taping. See The Tonight Show with Jay Leno, Jimmy Kimmel, Bill Maher, Craig Ferguson, the Price is Right. Register on the wish lists on each individual site. If you’re lucky, you can get tickets for Jimmy Kimmel for the taping on that same day on Hollywood Boulevard, or other tickets for shows like Catch 21 – just look out for the guys with the lists around the Chinese Theater.